As many of you probably do not know, this Anime only has 6 episodes. How can a story develop in a short amount of time? What will the story look like? Will it be rushed? These were all the questions I had going into this Anime. Often times, whenever you see an Anime with fewer episodes, I’d say it’s safe to assume that the story itself is going to be rushed — I definitely did. However, I was pleasantly surprised with the pace of the Anime and how much they were able to fit in a short amount of time. The setting takes place during the final year of high school. There, you are presented with two characters Miou Aida and Haruki Serizawa, two people with different personalities, polar opposites. They have been friends since the first year of high school. As this Anime falls under the genre of Drama, Romance, and School. I think it’s safe to assume what you think is going to happen between the two friends. 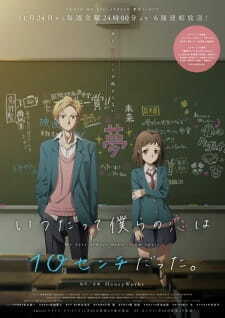 Ultimately, this story is about the two friends realizing that the feeling between them is something more that goes beyond ‘just friends’ and the various trials and tribulations they go through to not only grow as a character but also to further the friendship between each other — if only they could close in on the 10 cm between each other. What I enjoyed in particular about this story was that it did extremely well explaining why each protagonist acted the way they did, little did they know that these two friends connected in the most unimaginable way. The art of the Anime is something I really liked. The characters are very refined and are drawn in a way that’s very similar to Nagi no Asukara. As I’ve mentioned previously the characters look different compared to other Anime. They stand out more and look are better suited to match their surroundings. What I mean by that is, when you have characters outlined in black, they tend to offset the scenery around them, which could make them feel out-of-place — however, I didn’t feel that way with the character design. One thing I enjoyed the most, was halfway through the Anime. They visualize you as Miou, underwater trying to reach towards the surface for air. You find out there is a reason for that scene, it’s to symbolize drowning in guilt and it worked extremely well. As previously mentioned the Anime focuses on two characters Miou Aida and Haruki Serizawa and the relationship they have between each other. As the Anime takes place towards the end of the school year, if you want to talk about character development, it’s very minimal. You can assume that the bulk of development was done before the start of the Anime; you’re shown pretty much the end product. The dynamic between the two, I thought, was something that really appealed to me. They had mutual respect between one another, they cared for one another and knew each other’s flaws and what made each other ‘special’. They were each other’s support and were there when they needed someone to lean on. Towards the latter half of the Anime, something happens that challenges the bond between the two and the commitment they have towards another. I won’t go into too much detail, however, I thought the end result really fit both their character types and was a resolve I really liked. This ‘challenge’, I thought was the biggest thing in terms of character development because it leads them to understand and express how they really felt towards each other and it showed how much they leaned on each other for support. I personally wasn’t really a fan of the OP and ED to the Anime. Don’t get me wrong, they are good songs, pleasant to the ears and upbeat, however, to me personally, they felt normal.